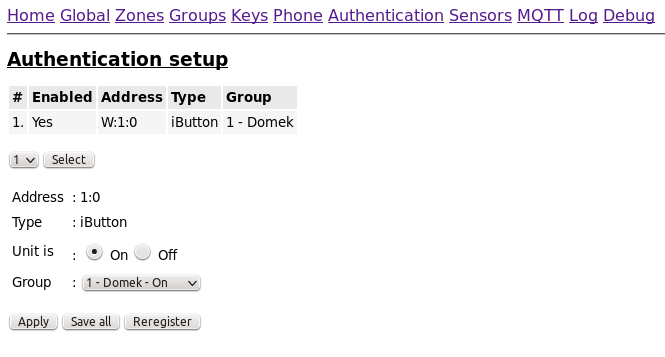 Authentication units have their own configuration page as shown on the right. On the top, again, is a summary of authentication units connected to system. The units can be connected by wire(RS485) or wireless(RFM12B). It is shown in the address field. "W" stands for wired and "R" for Radio. Address range is the decision maker here. Units in range 1-14 are wired and 17-143 are connected wireless. Address and type of the authentication unit is defined in remote unit itself. The few options to set is turn the unit On or Off, other is to attach them to certain group. If you miss any unit that should be there you can push "Reregister" button and the system will issue registration call. Going little more in detail, the all the settings are permanently stored in remote units in-chip EEPROM. By default the units register with their defaults, that is not enabled and belonging to group 16. And you have to set them on first. The other settings like functions they provide is dependent on the hardware and is coded in the registration message they sent to main board. Any remote unit can provide more then one function, as you can see on picture above. Unit 1 is iButton authentication unit and also provide ambient temperature.